South African siren Alice Phoebe Lou’s debut american tour made a stop in Atlanta on Monday, March 11. The audience she drew to the Vinyl at Center Stage Theater in the arts district was small, but the show was lively. Lou did not disappoint — she put on a warm and intimate show. Her latest album “Paper Castles” came out just before the performance, but already has the makings of a popular indie-folk album. Mixing a warbling voice with hypnotic music and techno-like sound effects, Lou is able to create a sound unlike any other. She played several songs from this album in addition to older songs and even an Angel Olsen cover. Lou’s presence was bold and unique. Blue and green plaid pants are rarely paired with a Batman baseball cap, neither of which are normally worn with a lacy lingerie bodysuit. 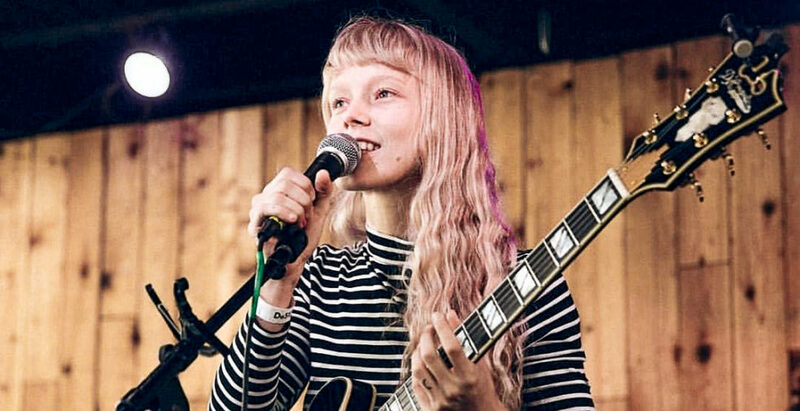 Top this look off with a makeup-free face and waist-length blonde hair and it is unmistakable that Alice Phoebe Lou is not on stage for anyone but herself. Her free-spirit vibe is echoed in her dancing and movements, too. Lou began the show in a button up shirt, standing only at the mic, with only subdued movements. With each song she warmed to the crowd, and her body language became more open. Finally at one point she took off the button up and started dancing around the stage with jerky, fun movements. Like with her unconventional outfit, the only purpose of the dancing was for her own enjoyment. As the show opened, Lou hoped to make it a “cozy night” for her crowd, a sentiment that was reiterated several times throughout the show. She also ended every song with a quick “thank you for listening,” making an already intimate show seem even more personal. She also mentioned a few times how tight the budget was for this tour. Her and her band are couch surfing across the country, and she was nervous if her Atlanta connection would come through ­— don’t worry, they did. She may come accross as a little awkward, but it is certainly endearing. In another she talked about feminism, and how she was sick of being told how to look, act, move, and be as a woman. This preceded a performance of one of her songs, “Skin Crawl,” which contains much the same sentiment. Though she sings with incredible range and emotion, Lou’s live voice sounds sightly adolescent and underdeveloped. Songs that sound ethereal and have a Florence Welch-like vibe on Spotify didn’t quite cast the same spell live. Her voice just comes off a little too breathy. The crowd was incredibly diverse and full of characters, especially notable in the small venue. Front and center in the crowd was a middle-aged father and his eight-year-old son. The boy didn’t take his eyes off the performance the whole time. In the back of the theater a barefoot man danced in a manner remarkably similar to irish step dancing. A woman in the front right of the crowd was in absolute ecstasy. Alice Phoebe Lou must be her favorite artist, as she was almost crying tears of joy at one point, was singing along to every word and admantaly thanked Lou after every song. For a ticket price that was less than a typical meal out in Midtown, the show was definitely worth it. A fun time all around, from the venue, to the crowd, to the performance. Alice Phoebe Lou knows exactly what kind of show she wants to put on, and nothing and no one is ever going to stop her from doing it.